Happy Wedding Tip Wednesday! When planning a wedding, there are a lot of aspects that go over looked and we know everyone’s budget looks different! We’re here to help add that ‘WOW’ factor when you and your fiancé first walk into your venue, without blowing your entire budget. Luxe is bringing you their best tips to bringing your wedding vision to life. We often have a lot of brides looking to add a pop of color to their guest tables! We love the idea of pulling in your color scheme throughout your table decor. Bride’s tend to think a budget friendly way to add this color is through a table runner. 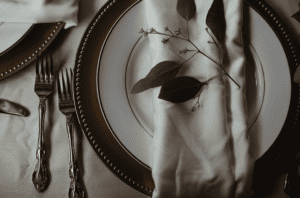 In our opinion, table runners tend to get lost between the glass wear, place settings, coffee cups, salt & pepper , etc. For just $10 more, you could pull that color throughout the linen! 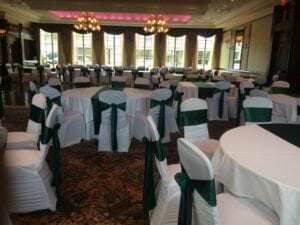 With the linen on the guest tables, it truly transforms the entire look of the room. It’s amazing what a little color or texture can do to a room! Do you have a specific color in mind? Check out our linen gallery to find the pop you’re looking for! Is there a bold color you’re looking to add but not sure how or not ready to fully commit to it? We love adding our own personal touches to a napkin or even a menu/thank you card! 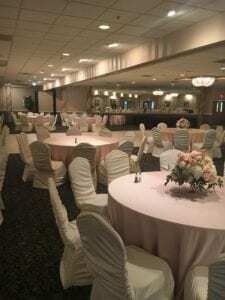 For example, one of our brides loves pink and wanted a way to soften her look, but her fiancé wasn’t a huge fan of incorporating the color into the wedding. With something as simple as text, ribbon or a sprig of greenery, you can easily pull in a new color while staying friendly to your budget! Adding this simple touch makes it a cute way to pull everything together, while putting your own personal spin on it! It’s all in the detail! 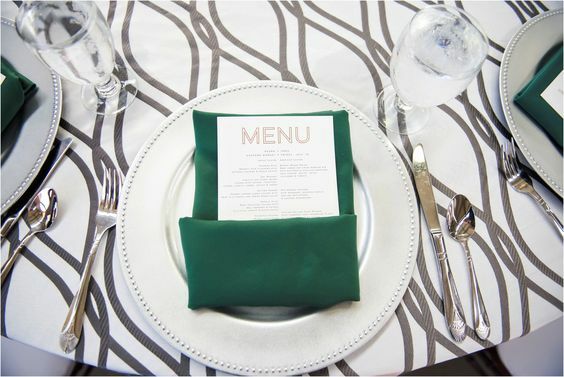 For more detail ideas, follow our Pinterest board: https://www.pinterest.com/luxeeventlinen/place-settings-napkin-folds/.